This online catalog can help you quickly locate and save details about undergraduate and graduate programs. Whether you are a prospective student or already enrolled, you can easily see what the University of Saint Joseph has to offer. Just click the printer icon in the upper right corner for a printer-friendly copy of the information you want. If you are a new user, click Create An Account. You’ll type your email address and a password. 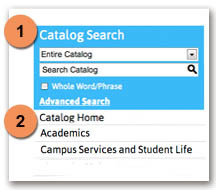 Then use the right menu or search box to find what you want in the catalog. When you want to save a section, click this link at the top of the page: Add to My Catalog. The next time you go to My Catalog, your material will be there. The University of Saint Joseph publishes its academic catalog once a year in the summer. Information in the catalog is accurate as of the publication date. Updates approved after the publication will be included in the next edition of the catalog. The provisions of this publication are subject to change without notice and do not constitute an irrevocable contract between any student or applicant for admission and the University of Saint Joseph. The University is not responsible for any misrepresentation of its requirements or provisions that might arise as a result of errors in the preparation of this publication. The University of Saint Joseph has reserved the right to add, amend or repeal any of its regulations and rules in whole or in part, at such times as it may choose. Nor shall this document be construed as an abridgment or limitation of any rights, powers or privileges of the Board of Trustees.